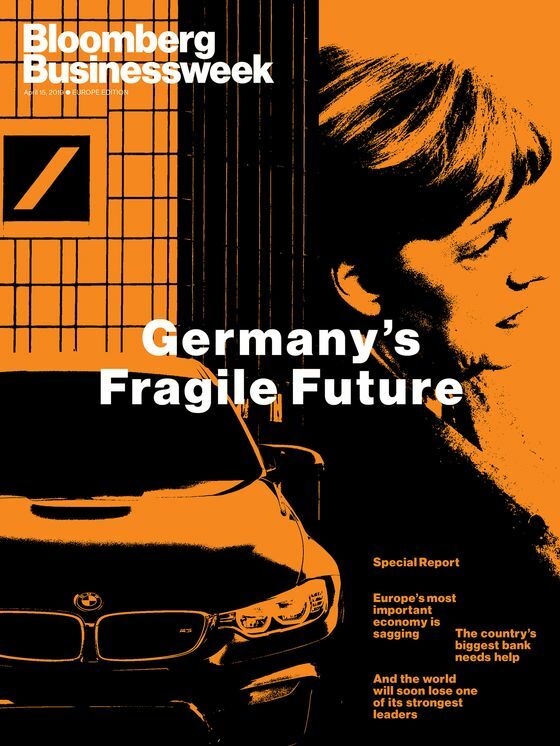 (Bloomberg Businessweek) -- Anniversaries can be painful for Germany, and this year is full of pivotal ones. It’s the centenary of the Treaty of Versailles, which imposed punitive reparations on the country at the end of World War I and laid the foundation for the next conflagration. It marks 75 years since the D-Day invasion, which led to the toppling of the Nazis 11 months later. And it’s 30 years since the Berlin Wall fell. That symbol of the Cold War’s demise is also a reminder of the post-reunification divisions—financial, social, and political—that persist between the country’s east and west. None of this bodes well for the country’s outward-facing economy. The world’s third-biggest exporter, Germany is more exposed than its competitors are to the headwinds of a global trade war. The outlook for growth this year has been slashed amid an alarming slump that’s dragging down all of Europe. Meanwhile, fellow Group of 20 nations from Brazil to Italy are following Donald Trump in turning inward and adopting nationalist programs. Germany is isolated, exposed to overseas agendas that are echoed—faintly but worrisomely—in its own homegrown populism. Yet it’s not all gloomy. Berlin is booming, and the benchmark DAX stock market index is up about 13 percent so far this year, as investors shrug off signs of economic weakness. The legions of small and midsize companies that make up the mighty Mittelstand remain innovative and highly specialized in premium niche areas. Germany is the third-most-automated country in the world. The shift to clean energy has turned the nation into a global center of renewables technology. There’s another anniversary this year: Postwar Germany’s constitution came into force 70 years ago in May, and four months later the first federal government was elected, with Konrad Adenauer at its head. The economic miracle—Wirtschaftswunder—was just around the corner. If Germany can recover that spirit, this year may yet mark one more turnaround.